Happy Fall y’all! I can’t believe I can say that now! 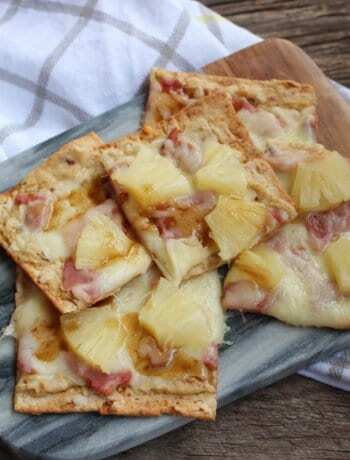 With football season upon us and all of the fun fall and winter holiday parties just around the corner, these Hawaiian Ham and Swiss Sliders are sure to be the perfect addition to any of the social events you have planned. Speaking of parties, if you love to host parties or just attend them, check out my Easy Baked Spinach Artichoke Dip and my Tex Mex Queso Blanco Dip both are perfect for parties! These Hawaiian Ham and Swiss Sliders really take me back to all of the fun “Harvest Parties” we used to have growing up. I was raised in a little Oklahoma town just thirty minutes from the Arkansas State Line and in what we always called “Green Country” because it was so lush and green. Being raised in a small town, we attended a small community church and each October, our Harvest Festival at church was the highlight of the season. 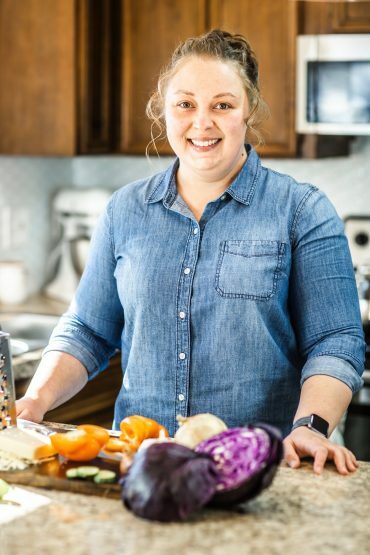 The entire church would pitch in to make this Harvest Festival a success and folks from all over the community would join in for a grand time. We usually had these Harvest Festivals on or near Halloween night just to keep the kids out of trouble and give them a safe environment in which to have fun. Like I said, it was just the highlight of our year; planning our costumes was as much fun as the event itself! We also brought baked goods and finger foods and chipped in to have a big church potluck that was just about the best eating you could find. After we ate until we could barely move, we played carnival style games, told scary stories, and even had a hay ride out in the country! The potluck and hayride were my favorites because you never knew what to expect from either. Someone almost always brought Ham and Swiss Sliders to the potluck and that was one of my favorites as a child with BBQ Little Smokies coming in a close second. All in all, it was a wonderful time had by everyone in attendance and I will cherish those memories forever. If you are hosting or attending any parties this fall and winter, I can assure you, these Hawaiian Ham and Swiss Sliders will be a crowd pleaser! So easy to make and yet, so delicious, you will be coming back for more of these little finger sandwiches! 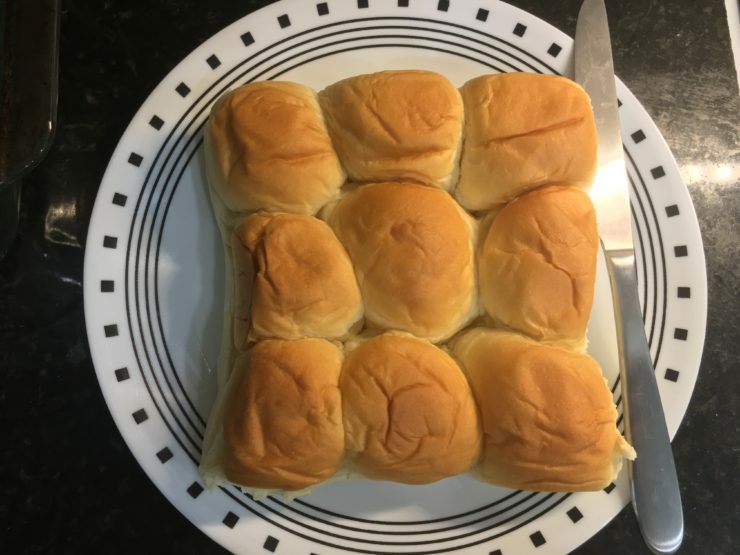 I started out with 9 small Hawaiian Rolls – if you’re cooking for more, I would make at least 12. Use a serrated bread knife to slice the rolls in half, removing the top half from the bottom half. Once you’ve separated the top from the bottom, set the top half aside to work with in a minute. 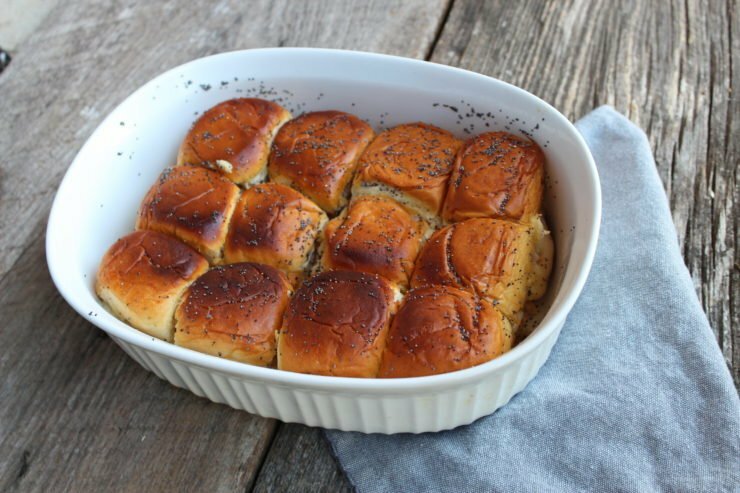 Place the bottom half of the rolls in a glass, square, 8×8 casserole dish. If you are making more than 9 sliders, use a larger casserole dish such as a 9×13 square or oval dish. Squirt some Honey Dijon Mustard over the bottom half of the Hawaiian rolls. Just eyeball the amount here and go with what feels right – I never measure this part. 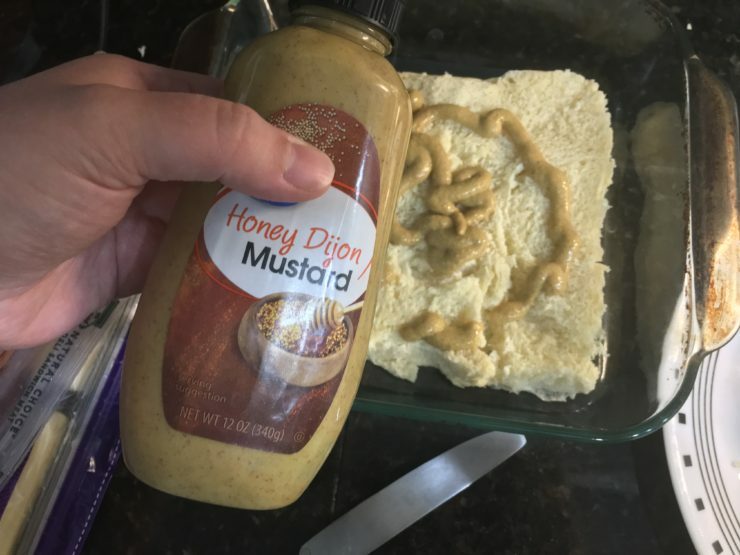 Also, if you’re not a fan of Honey Dijon Mustard you can always use Spicy Brown Mustard or Honey Mustard. 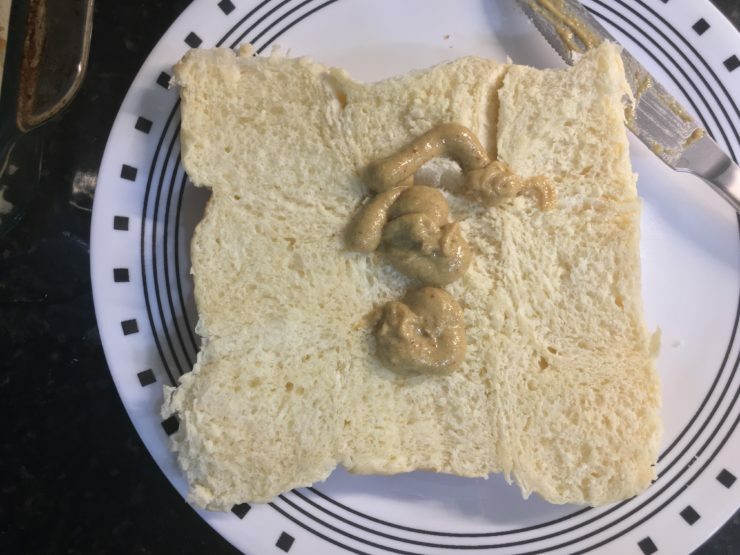 After adding the Honey Dijon Mustard to the rolls, spread it all over with a butter knife. 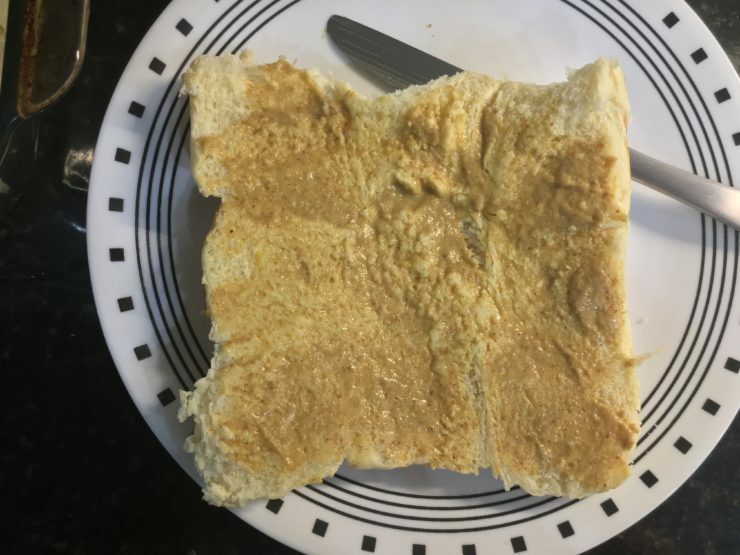 Just make sure the Honey Dijon Mustard is spread out evenly over the bread so that none of the bread is left without. After spreading the mustard on the rolls, add 4 slices of swiss cheese. 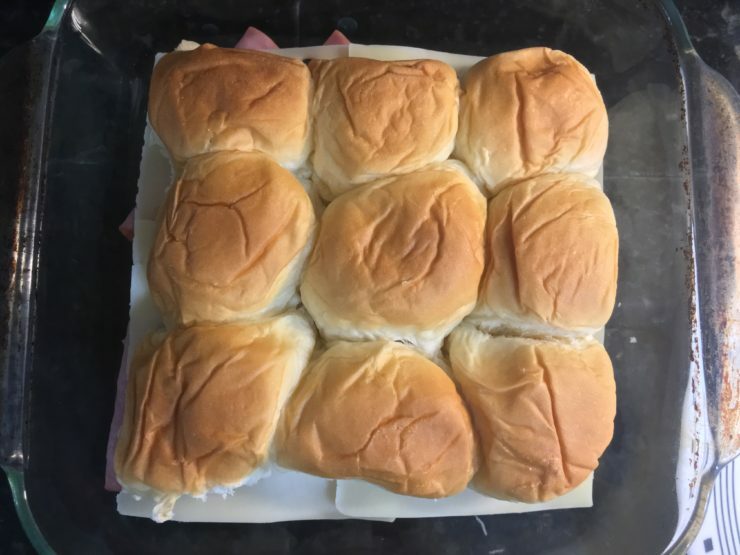 If you’re making Ham and Cheese Sliders, add 6 slices of swiss cheese. 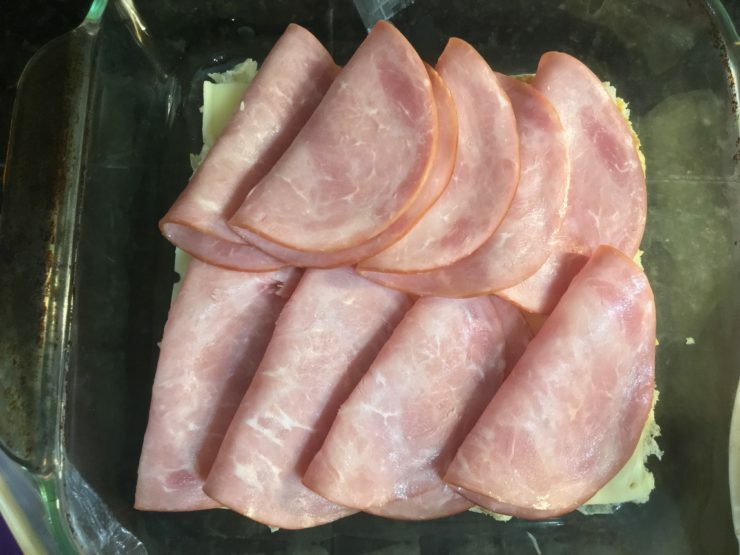 After adding the sliced swiss cheese to the Hawaiian rolls, add 8 slices of Deli cut Honey Ham to the top of the cheese. I like to fold my ham in half to make it look a little prettier and also make it slightly thicker on each slider. 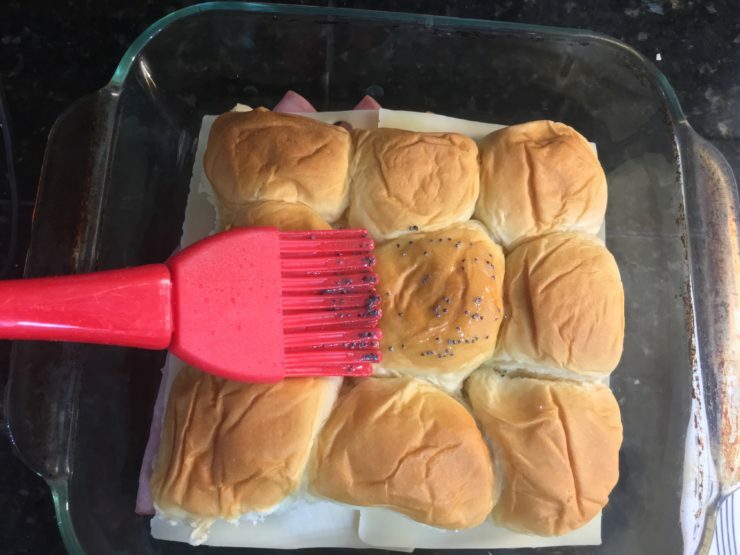 If you’re making 12 sliders instead of 9, use 10 slices of Honey Ham. Layer another 4-6 slices of swiss cheese over the top of the ham on the Hawaiian Rolls. 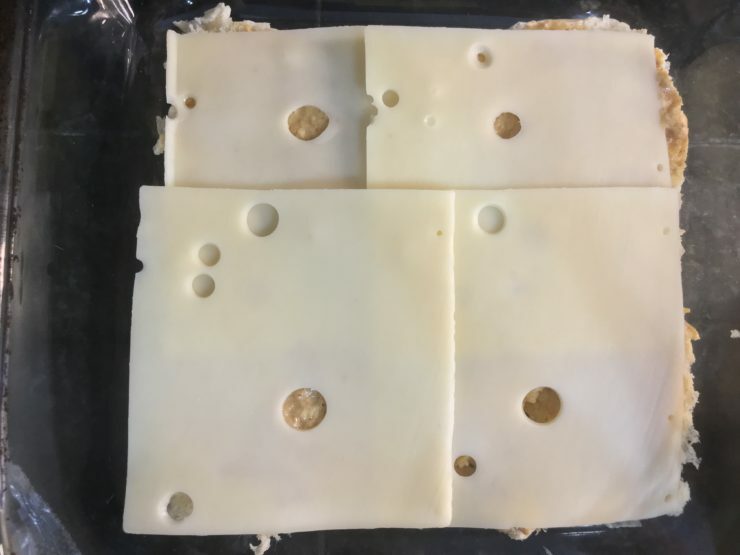 If you really hate swiss cheese you can always use cheddar, American, or Provolone as a substitute. 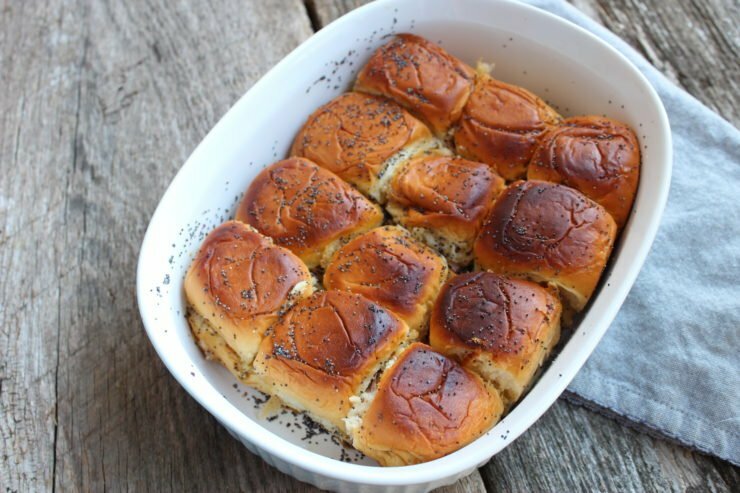 Now that your Ham and Cheese Sliders are all but assembled in the casserole dish, it’s time to turn your attention to the top half of the rolls we’ve had set aside. Turn the rolls over, with the cut side facing you, and add some Honey Dijon Mustard. 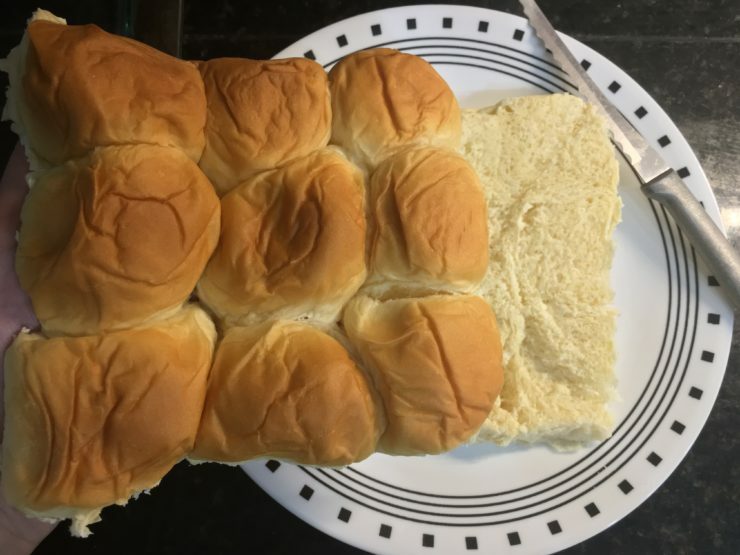 Use a butter knife to spread the Honey Dijon Mustard over the Hawaiian Rolls to disperse it evenly. Again, this is something I didn’t measure and instead just eyeballed the amount. Place the top half of the Hawaiian Rolls on the already assembled sliders in the casserole dish. Don’t worry about cutting these sliders into individual sandwiches just yet – that’s something we’ll do after they cook. 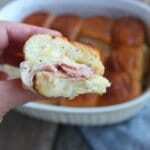 You’re almost ready to bake these Hawaiian Ham and Swiss Sliders – but don’t forget the butter topping! Melt 1 1/2 tablespoons of butter in a small bowl and then add in 1/4 teaspoons of poppy seeds. The fastest and easiest way to melt the butter is to heat it for about 15-30 seconds in the microwave. Once the butter is melted brush it onto the top of the Ham and Cheese Sliders. 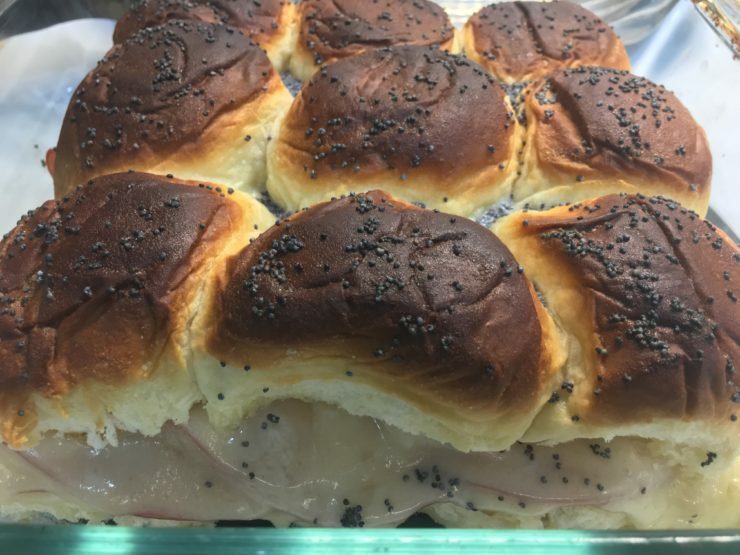 This butter and poppyseed glaze gives these Ham and Swiss Sliders such a wonderful, buttery flavor! In case you’re wondering, you can use salted or unsalted butter – just make sure it’s REAL butter. 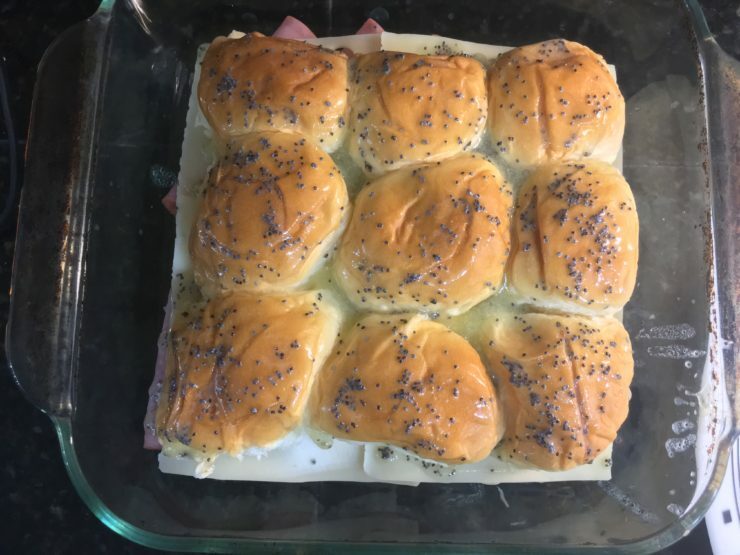 After brushing the melted butter and poppyseed mixture on top of these Ham and Swiss Sliders don’t worry if the butter pools slightly. The butter will not cause the Ham and Cheese Sliders to become soggy or anything like that. It all soaks in and bakes out as it is cooked. Now that your Hawaiian Ham and Swiss Sliders are ready to go, place them in the oven. 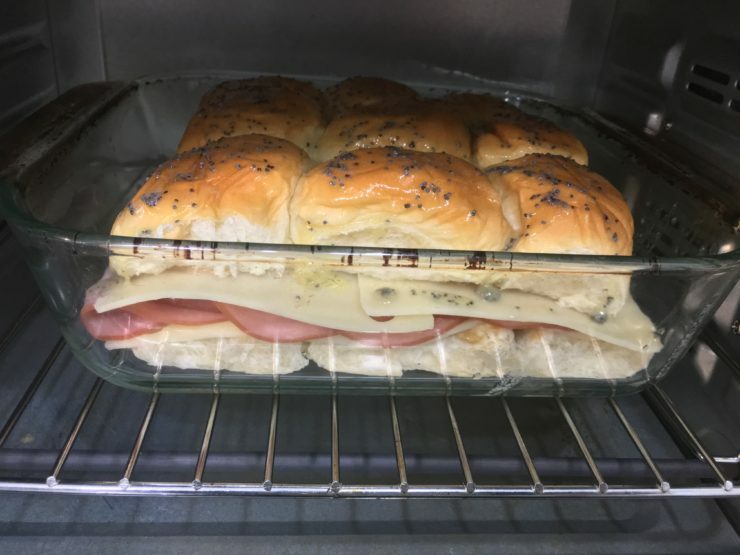 Bake the Ham Sliders in the oven at 350F for 10-15 minutes or until the cheese is melted and the tops of the rolls are golden brown. Once your ham and cheese sliders are baked, remove them from the oven and cut them in to individual sandwiches. Wait until the sliders cool slightly before removing them from the pan. You can serve up your ham and swiss sliders in the casserole dish you cooked them in, or pile them on a pretty seasonal platter for a little extra fun. 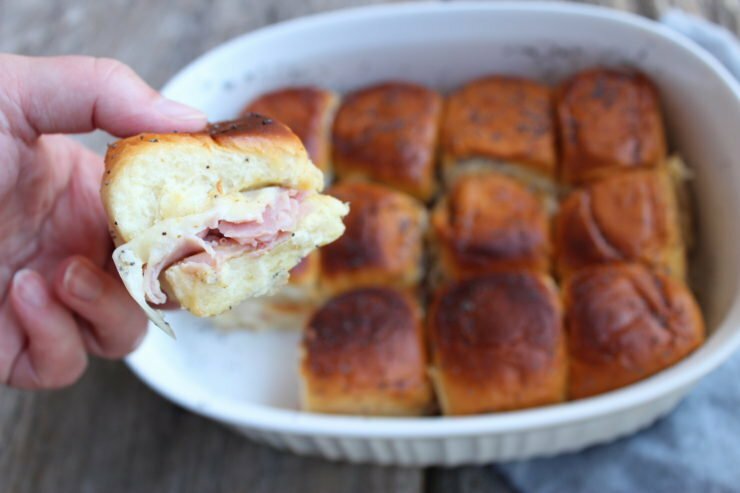 These Ham and Cheese Sliders are perfect to take to potlucks, birthday parties, holiday parties, baby showers, or wedding showers. 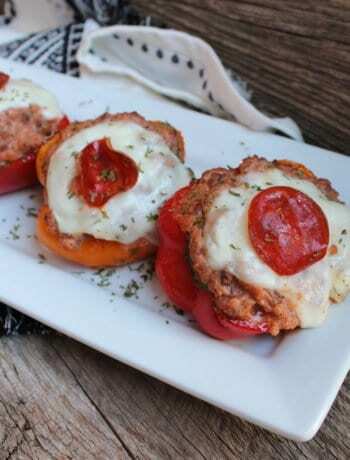 I even like to make these Easy Sliders for a fun date night in with my husband or game night for the family. I can guarantee your Little’s will love these fun finger sandwiches as well! I hope you have enjoyed traveling down memory lane with me today as I reminisced on Autumn Past. 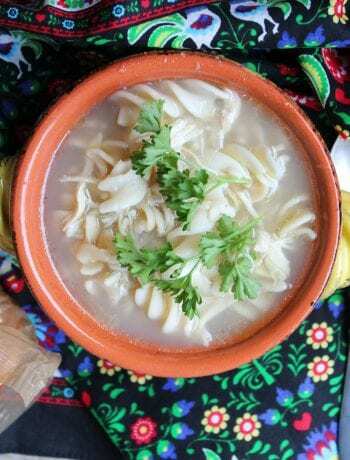 I really enjoy having you here with me, cooking in my kitchen, and I do hope you will come back soon! 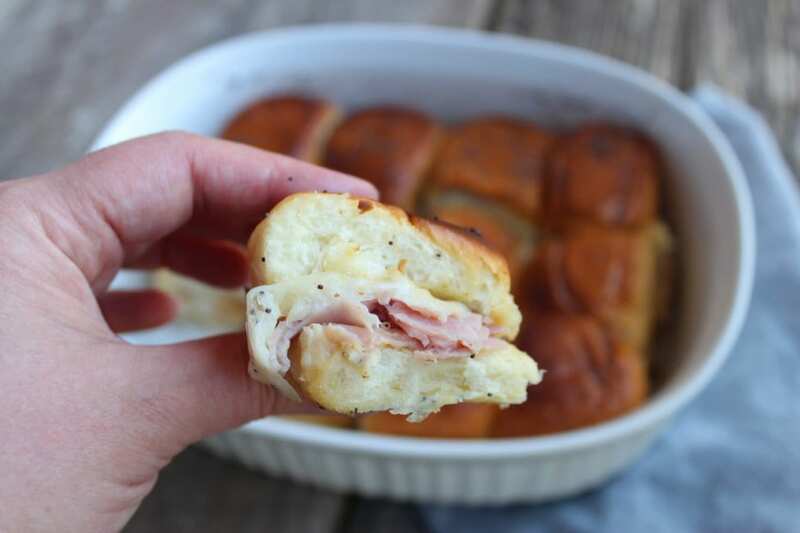 Hawaiian Ham and Swiss Sliders are easy baked sliders with a honey mustard sauce, perfect for tailgating parties, Halloween, Christmas parties, and any party that a fast and easy appetizer is needed. 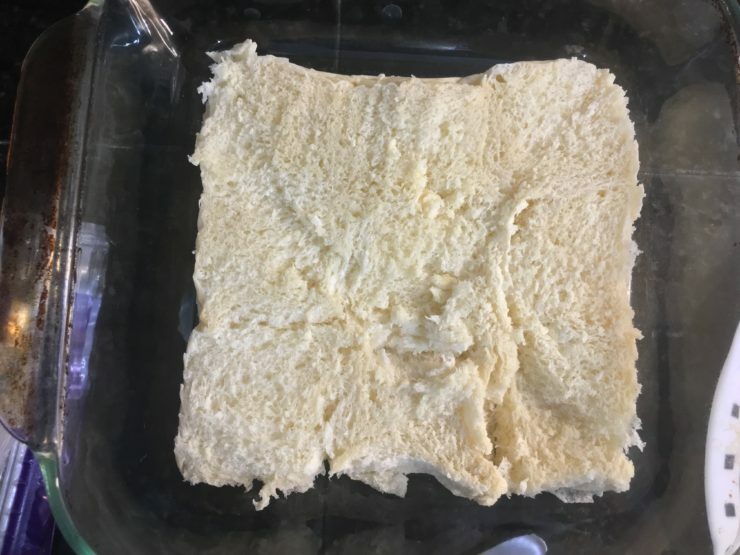 Cut the Hawaiian rolls in half, removing the top from the bottom. 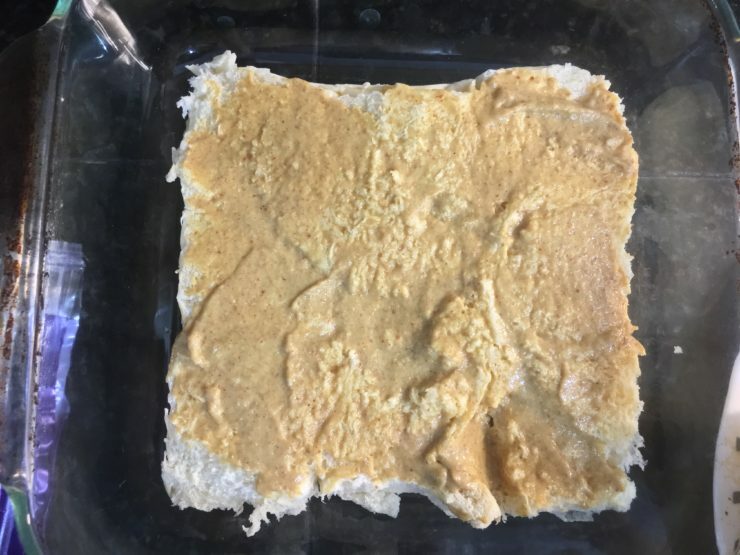 Spread Honey Dijon Mustard on the top and bottom half of the rolls, then place the bottom half in an 8x8 casserole dish (or if making 12 sliders, place in a 9x13 casserole dish). 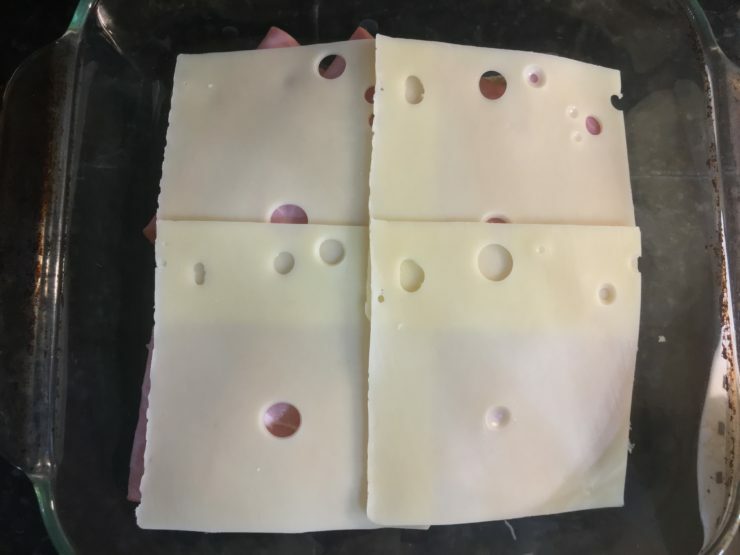 Place 4 slices of swiss cheese on the bread (or 6 if making 12), then fold 8 slices of ham in half and lay it on top of the swiss cheese (or 10 slices of meat if making 12). Lay another 4-6 slices of swiss cheese over the top of the meat, then add the top half of the rolls back onto the sliders. 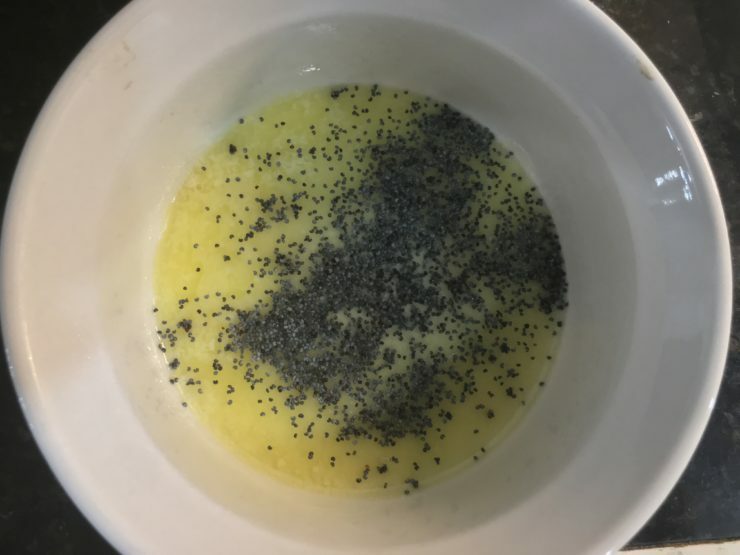 Melt 1 1/2 tbsp of butter in the microwave until liquid, then add the poppy seeds. Brush the top of the Hawaiian Roll Sliders with the butter/poppy seed mixture and bake in the oven at 350F for 10-15 minutes or until the cheese is completely melted and the top of the rolls are golden brown. Remove from the oven, allow to cool slightly, then cut into individual sliders. Any type of deli cut (lunch meat) ham or turkey can be used for this recipe (smoked, mesquite, honey, baked, roasted, etc.) I used Hormel All Natural Honey Ham. We will love these classic sliders! Thanks so much for sharing your post with us at Full Plate Thursday and hope you have a great week!